In Bharatha Natyam generally, Ananda Thandava pose is used to symbolize Lord Shiva as the symbol of Bharatha Natyam. This particular Ananda Thandava pose of Lord Shiva is commonly known as Lord Nataraja. Lord Nataraja bears five important Pancha Boothams (the five elements) which are believed to be the most important elements for the creation of the world. The five elements are the sky, water, fire, wind and earth. The Lord bears the moon on his head which indicates the sky; similarly, the River Ganga flows from the terrace of the Lord which indicates water. The dancer of the Ananda Thandava is called by several names connected with dance, namely Lord Nataraja (King of dance); Kuthapiran, Kootharasan, Aadal Valaan and Ampala Koothan are some of the other names of the dancing deity. In almost every Bharatha Natyam recital, this particular dance pose of Lord Nataraja adorns the stage. And it is the universally acknowledged symbol of Bharatha Natyam. Four to five different important Lord Nataraja bronze sculptures were discovered from different locations in the Polonnaruwa period archaeological sites. The dancing deity Lord Nataraja is the Lord of dance. One Lord Nataraja statue with all traditional Hindu Saiva Agama Sastra (Traditional basic principle of Hindu codes) features was discovered at the 1st Siva temple of Polonnaruwa. This particular sculpture was discovered in 1908. According to Great scholars, this sculpture is almost the same as one of the Nataraja sculpture of Chennai Museum. Another Lord Nataraja statue was discovered from the backyard of the 5th Siva temple of Polonnaruwa in October 1960 by C E Godamkumbura. This was one of the tallest Lord Siva’s sculptures found in Sri Lankan archaeological sites. The height of the sculpture is 140 cm. It resembles some exceptional features among all other Nataraja sculptures discovered from the archaeological sides of Polonnaruwa. A cobra is seen at the right-hand elbow level of this dancing deity’s statue. An excellent Sinhala artistic influence could be assessed at this sculpture. The base of this bronze sculpture contains beautifully carved exclusive and exquisite sculptural figures. Numerous instrumental players’ figures are beautifully carved on the pedestal. At the extreme right end, a female figure is depicted with cymbals. Similarly, a flute player is also carved at the base. As compared to other bronze Nataraja sculptures, such beautiful carved figures at the base are not at all found anywhere else in Sri Lanka. The sculpture’s outer frame is generally known as Thiruwasi. According to Hindu philosophy, Thiruwasi denotes the life and death cycle of the living beings. According to Hindu mythology, the outer frame named Thiruwasi should be round, but this Thiruwasi is in semi-square shape. The sculptor who made this sculpture, without considering the philosophical meaning of the Thiruwasi. Yet some other traditional Hindu features are seen in this statue. Beautiful anklets adorn the legs. An Uddeki is seen at the rear right upper hand. A fireball is seen at the upper rear left hand. The lower down right hand is depicted with Abaya hasta. But river Ganga and Moon at the terrace of the Lord are not seen at this sculpture. In all the traditional Nataraja dancing deity bears the moon and river Ganga at the terrace. It denotes two different elements of Panchaputhams such as the sky and water respectively. Normally Lord Nataraja sculpture is always depicted with spread hair. Such a feature is missing in this famed Siva Nataraja sculpture of Polonnaruwa. Hence to a certain extent, this particular Nataraja sculpture is quite different from the all other Nataraja sculptures. Hence it is assumed that this particular statue must be a creation of a local sculptor without understanding the traditional features of Hindu philosophy during the Polonnaruwa period. It reveals the cultural admixture or amalgamation of Hindu and Buddhist traditions. The height of another Lord Nataraja statue is 64.5 cm. This particular bronze statue was discovered from the 1st Siva temple in Polonnaruwa. The hair is separated into six layers. On both sides, the hair is depicted as spread out. The spread out hair reveals the strenuous and vigorous dance of the Lord. According to sch olars, this is one of the excellent creations of Polonnaruwa bronzes. Like all the other Nataraja poses this resembles the same characteristic features. But the unusual feature of the statue is the length of the legs. The length of the legs is quite long. It is believed that this was made by a trained sculptor. The ornamental decoration of the statue is excellent. Normally the body should be straight and the Araimandi sitting position should be adopted in this pose. As compared to other Nataraja poses the half sitting posture extent is not much seen in this statue and the body is slanted more to the left side. Another beautiful Nataraja sculpture was found at Polonnaruwa. The unique feature of the sculpture is, without Thiruwasi, (the round outer frame) and tuft. It is totally based on the Śaiva tradition. The height of the statue is 61.5 cm. This statue was discovered at the 5th Siva Devale of Polonnaruwa in 1908. Beautiful hair decoration and ornamental decorations adorn this sculpture. 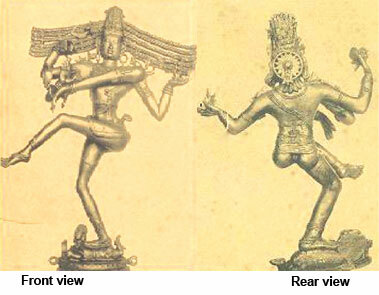 The Muyalavan’s body position (demon under the right leg of the Lord) is quite different from all the other Muyalavan’s body position of other Nataraja statues. Anyhow this is an excellent handiwork of a Dravidian sculptor. The posture of Nataraja sculpture is the same as all other Nataraja sculptures. The remarkable feature of the statue is that the absence of Thiruwasi. The Nataraja sculptures of Polonnaruwa are unique in nature and reveal the traditional Hindu and Indian influence on Sri Lanka during the Polonnaruwa period.